Art, Galleries, Museums, Paris, je t'adore!, Travel - bon voyage!, Vive la France! Even as a child, I didn’t have much patience for sand castles. ‘What’s the point?’ I wondered, ‘in spending painstaking hours building crenellations, filling moats and adorning walls with shells, when all the effort would only be destroyed by (a) someone’s careless foot, (b) a galumphing dog off its lead or (c) the incoming tide?’ I was far happier torturing hermit crabs or sea anemones in rock pools. 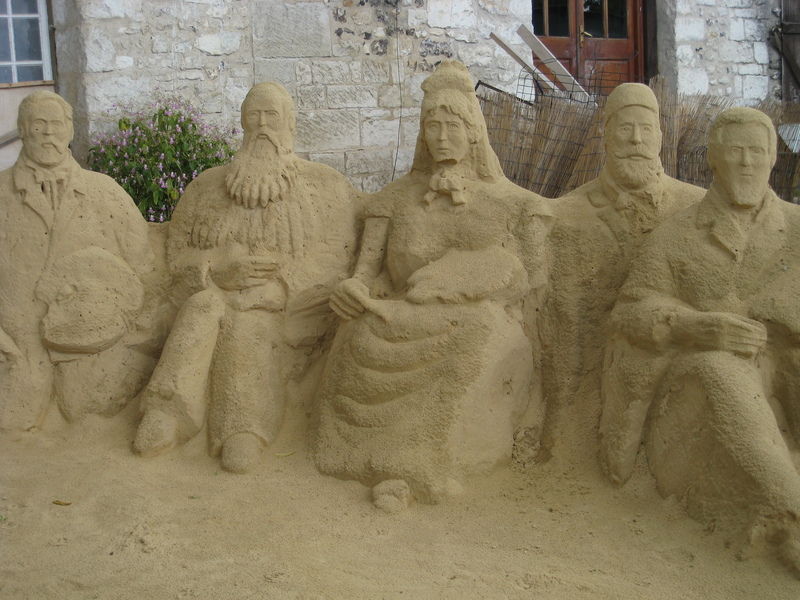 Even so, there are some talented folk out there who both possess the patience for sculpting sand and artistic skill. 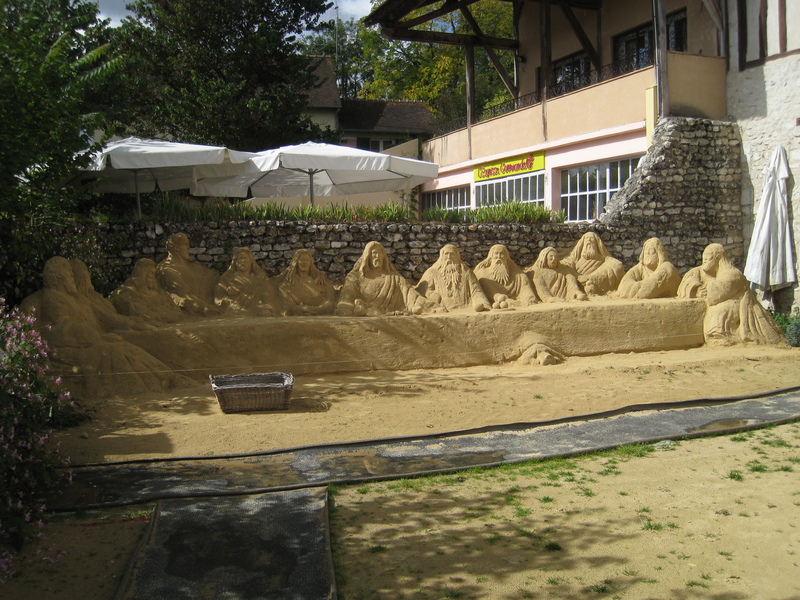 Two such folk create masterpieces of sand far from any beach in Giverny, the village where pilgrims paying homage to the late, great Claude Monet flock in their hundreds of thousands each year. They are Chris Avril and Jean-Pierre Porchez, whose compositions exhibit talent, perseverance and poise. To stumble upon their sculptures is a pleasant surprise in a place like Giverny, where there are altogether too many mediocre art works hanging in galleries designed to lure the tourist. I think the bulbous items on the ‘table’ may be a carafe of wine and a bread roll, but can’t be certain. In any case, it’s hardly enough to sustain a group of thirteen. Across the way we spot some more bearded chaps – this time, artistic heroes. This man with palette in hand is Renoir. And this is Monsieur Monet, the reason we were all in Giverny that late September day. To the left is Gustave Caillebotte, a great friend and contemporary of Monet, and to the right is the poor, tortured Vincent Van Gogh. From left to right we have Renoir, Pissaro, Berthe Morisot ( a female impressionist cleverly breaking up all that maleness exuding from the sand), Sisley and Caillebotte again. The exhibition of sand sculptures was free to view and no one seemed to be guarding the fragile creations, yet thankfully there were no galumphing dogs in sight, and all who stepped in to visit left their careless feet at the gate. In fact, when Monsieur and I were there, all were speechless with awe at the hours of painstaking work on display. The question that nobody dared ask, however, was ‘what’ll happen when it rains?’ and this is Normandy, so rain it will. 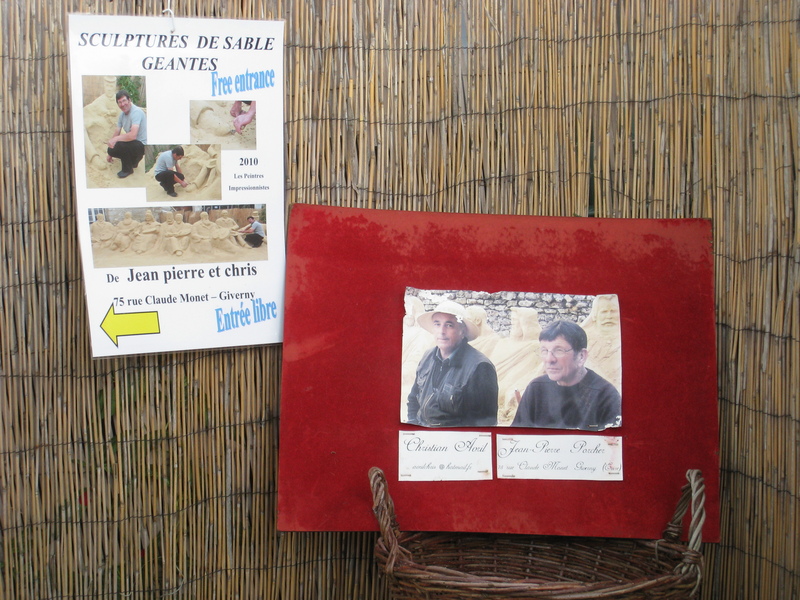 My guess is that Chris and Jean-Pierre will wait for the storm to pass before quietly fetching their buckets and spades and starting from scratch. 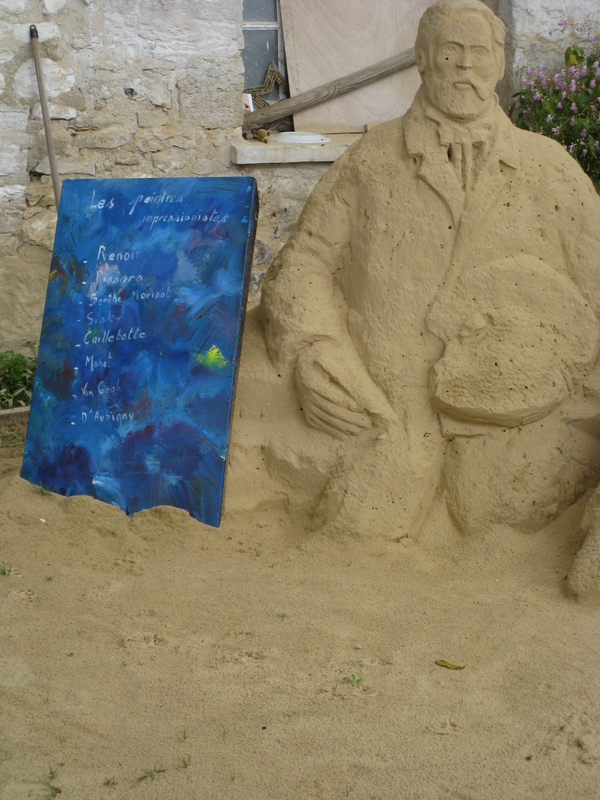 Admirable, really, to be that patient, not to mention ingenious to create a gallery of sand in a painter’s village. Now, this is as pure a form of creativity as I’ve ever seen! And, since I’ve just started a new blog about creativity, I am 100% enthralled with this post, Epic. The art of it is transience. No one possesses it. Ever. 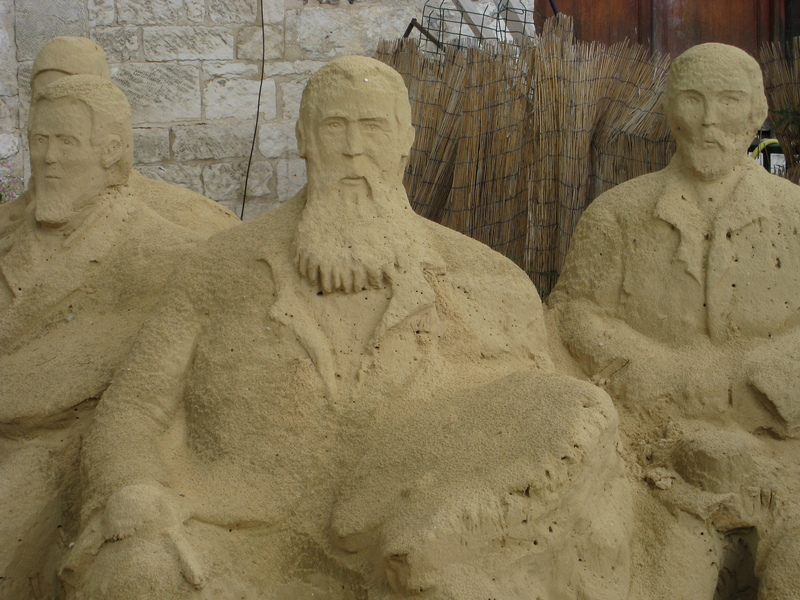 If these statues were marble, they would be worthy enough…but sand? O, I could go on. And, probably will. Happy New Year, sweet Epic and Monsieur! Oooh Pat! Thank you, as ever, for the feedback. 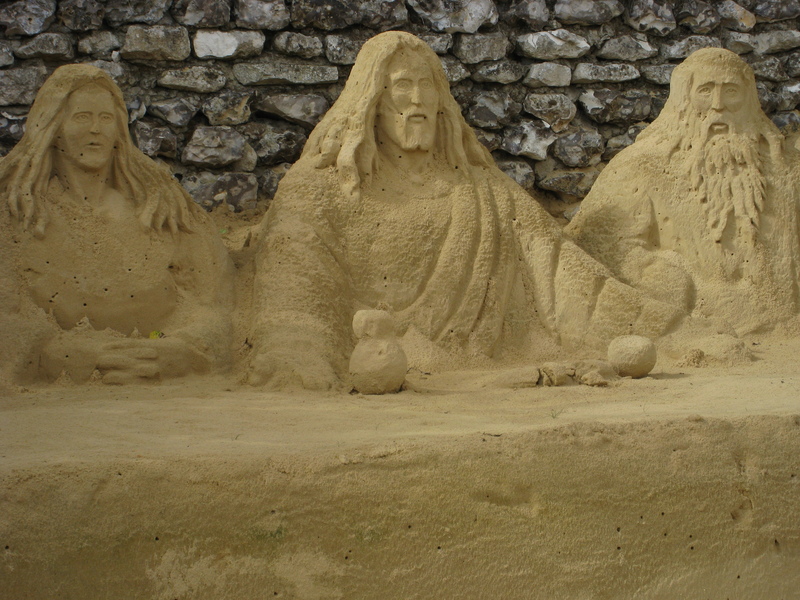 I was bowled over by the sand sculptures. Transience was a word in my head when I wrote that post, but I didn’t use it – yet you got it straight away! Happy New Year to you, too, and I’m so pleased I know where you are now. Was beginning to worry that you’d disappeared from the ether! Although, the last time I went I only remember a guy passed out in the beer garden with one ball hanging out of his adidas shorts. Oh yes, and thanks also for the *thspethill* imagery of the guy in the Adidas shorts. Mmm. Kinda just lost my appetite. Snort.